The early history of America's railroads, the birth of the steam engine locomotive and how a steam engine works are discussed in Program 1. 00:10:05British engineer, George Stephenson, invented the first steam locomotive, which started railroads and steam transportation during the Industrial Age and gave birth to the railroad industry. 00:08:28America's first railroad, the Baltimore and Ohio, got its start with Peter Cooper's first locomotive, Tom Thumb, and later became a leader with Samuel F.B. Morse in telegraph communication as well as making the railroad industry's first multi millionaire, Johns Hopkins. 00:05:55The locomotive, also known as the iron horse, was a steam engine on rails and it needed an engineer and a fireman to operate it. 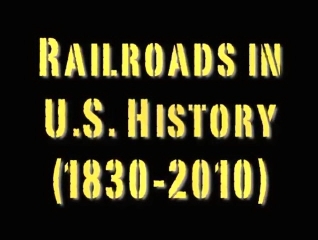 Railroads, trains and the railroad industry jumpstarted America's Industrial Age. 00:04:44The Baltimore & Ohio kick started the America's railroad industry which would lead the American economy to create the unique American brand of capitalism. 00:07:05American railroads were responsible for many innovations, including middle management, cost benefit analysis, the common carrier policy, as well as bringing industrial stocks to Wall Street's stock market and the New York Stock Exchange. 00:11:48America's first railroad boom launched major companies such as the Pennsylvania Railroad, the Reading Railroad, the Erie Railroad, the New York Central Railroad, and the Rock Island Line. During the Civil War and the years after, America's railroads were responsible for changes in military tactics, innovations to the railroad industry, and the building of the first transcontinental railroad. 00:05:55During the Civil War, railroads proved their importance at the Battle of Chickamauga, a Union defeat under General Rosecrans, by saving the Union army and providing General William Tecumseh Sherman a supply line for his famous March across Georgia. 00:05:12Train Depots, George Pullman's Pullman cars, and airbrakes invented by George Westinghouse, were three important innovations in the Civil War Era. 00:04:39America's first Transcontinental railroad, built by the Central Pacific and the Union Pacific, was a direct result of the Homestead Act and the desire to link California with the rest of the nation. America's Second Railroad Boom made the railroad industry the greatest industry in the United States, but the heyday of the railroads would end in the 20th century and the modern railroad industry of the 21st century would emerge. 00:03:25Four more transcontinental railroads would be built after the first one, including the Northern Pacific, the Great Northern Railway, the Southern Pacific, and the Atchison, Topeka and Santa Fe. 00:08:37The Robber Barons, such as Jay Gould, Cornelius Vanderbilt, J.J Hill, William Clark, and William Jackson Palmer, were entrepreneurs who created great railroad empires. 00:03:36Railroad Wars happened when the Robber Barons began charging exorbitant costs on small town farmers and businessmen, which led to the enactment of the Interstate Commerce Commission, used by Teddy Roosevelt to regulate railroad shipping rates. 00:03:50The railroad industry had become so chaotic that it needed to consolidate, a move led by E.H. Harriman, starting with the Union Pacific at the turn of the 20th century and continuing with the invention of the diesel locomotive in the 1930s. 00:03:23Modern Railroads are a vital part of the American economy, as seen by Warren Buffet's purchase of the Burlington Northern Santa Fe Railroad.